Pursuing a monetary award after a trucking accident is likely to prove much more complicated than after a simple motor vehicle accident. The reasons why have much to do with the potential sheer size of these such accidents and the likelihood that quite a few parties will either bear responsibility for, and have a financial interest in, the event. When a commercial truck crashes into an edifice -- or collides with another motorist -- the chances that a chain reaction occurs, with injuries to many people and damage to an enormous amount of property, are great. As such, the need for a qualified and highly seasoned personal injury law firm is critical. Identifying the negligent parties after a Trucking Accident in Miami or elsewhere in South Florida, be it involving an 18-wheeler, a big rig, an oil tanker, a tractor trailer, or any manner of smaller vehicle, can only be achieved through careful and thorough analysis of all of the facts surrounding your case. Perhaps the driver was solely to blame, as so often is the case. Improper and reckless turning, breaking, lane-changing, and acceleration have all been to known to cause horrible truck accidents. There could have been maintenance issues or problems that caused a mechanical breakdown. Other equipment under the hood could have been flawed or damaged. The list of possibilities is long and requires the savvy of a skilled personal injury law firm for thorough examination. No matter how or why a truck accident takes place, the truck driver never is the one most critically injured. It's always the driver of the other car, motorcycle, or SUV. At the Law Offices of Brumer & Brumer, we have been aggressively fighting for more than a half-century for the rights of our clients who have been injured in all manner of motor vehicle accidents. We will vigorously pursue your truck accident claim, ensuring you are fully compensated for your doctor's bills, lost wages, pain and suffering, destruction of property, as well as possible punitive damages. 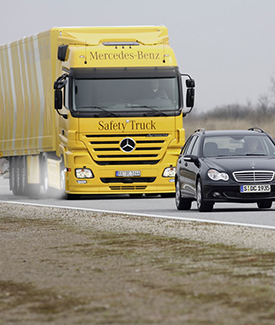 In cases involving commercial vehicles, there almost certainly is going to be an insurance company with deep pockets and vast resources working to minimize the amount you are paid. They almost certainly will dispatch an attorney to the scene of the accident. You should never speak to an insurance company's attorney. At the Law Offices of Brumer & Brumer, we will speak on your behalf so you are not locked into a statement made under extreme physical and emotional duress. We are fearless and zealous defenders of the rights of our clients. Florida is one of the largest states in the country, with more than 19 million residents in 2012. And that number is only growing as Baby Boomers from the Northeast continue to relocate to all parts of Miami, Fort Lauderdale, and the Palm Beaches. Accordingly, then, the need for commercial products carried by commercial vehicles is only going to rise. When they occur, the toll they take in terms of loss of life and life-altering injuries can be unspeakable. If you or a loved one has been involved in a truck accident anywhere in South Florida, we encourage you to call The Law Offices of Brumer & Brumer.